Dynomax is an equal opportunity employer. Dynomax offers competitive benefits, contact Dynomax Human Resources department for more details. 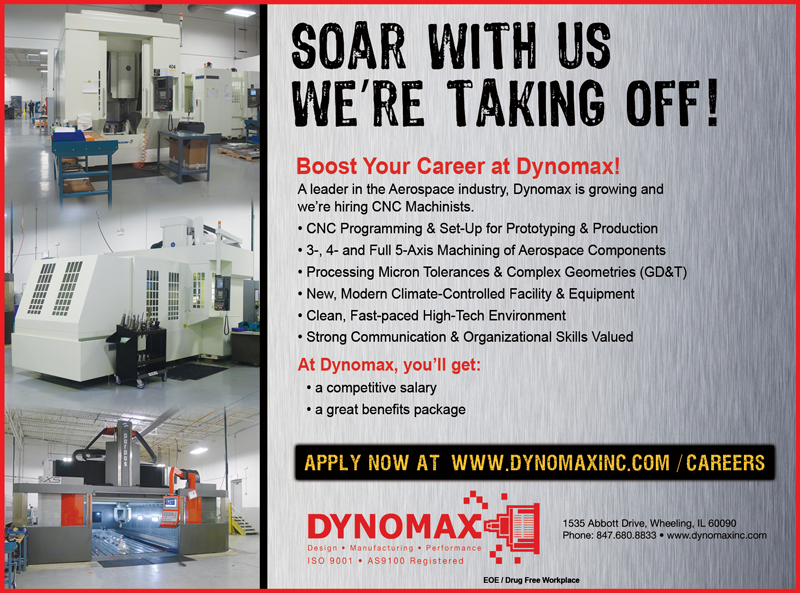 Dynomax is looking for operators, machinists and programmers available for basic setup through complete processing of advanced components for CNC turning/CNC milling machines - utilizing metal machining knowledge to set-up and develop machine processes as well as operate a variety of CNC machines to produce high-precision machined parts. 1st, 2nd and 3rd shifts are available! Able to read and interpret drawings and work instructions. Proper inspection of first-run and in-process parts. Safe operation of CNC machinery. Ability to set-up and machine components. Ability to create and edit programs on Mastercam and Unigraphics NX software. Ability to keep a safe and clean working environment. 2.5-5 years experience in programming, editing, set-ups and operating of CNC machines for precision parts. Read and understand GCode/measuring equipment. Interpret drawings with complex GD&T symbols. CNC mills - 3 to 5 axis. CNC lathes with live tooling. Mastercam programming and/or Unigraphics NX software experience. Dynomax, Inc. strives to provide a friendly, clean, and encouraging workplace. Our benefits include competitive wages, paid holidays and vacation, medical, dental, life and disability insurance coverage, flexible spending account, and 401(k).